You’re following Paleo(ish), trying to cook your own food, and you can’t eat chips. I know, it’s a big problem because you want chips. You want that salty, crunchy, crispy texture without the white potatoes or the carbs. I suppose you could bake some sweet potato chips, but we all know they just don’t quite do the trick. I have a solution…meat chips. Stay with me. 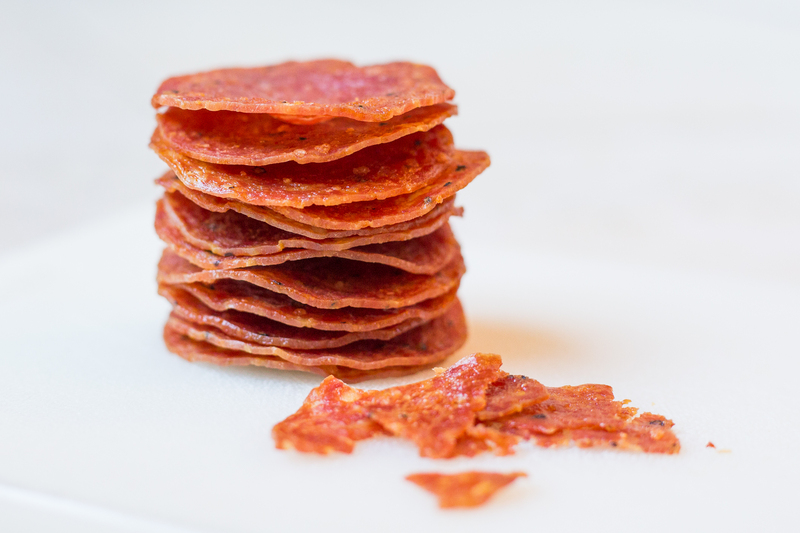 More specifically, I’m talking about salami chips, or soppressata chips if you really want to get fancy. These crispy little bites of goodness are the only thing I’ve found that satisfy that particular need for a chip-y texture while also keeping my carbs down and my protein up. Meat chips are also ridiculously easy. Pretty much all you have to do is grab your favorite charcuterie, lay it out on a cookie sheet, and bake it slooooowly to render out all the fat. When done right, you’ll be left with an amazingly crispy chip of salty happiness. What’s particularly great is that you can choose any sort of charcuterie you like. A brand right off of the Wal-Mart shelf will work just as well as that grass fed, organic, fennel/chili Calabria sausage you import from Italy. The only requirement is that everything be pre-sliced. You won’t be able to get slices thin enough to crisp up properly if you’re slicing by hand. My good friend and fellow chef Keka Schermerhorn first taught me to “make” these (though there’s not much cooking involved beyond trying not to burn something), so all credit goes to her. I just take the pretty pictures and write it all up. And eat all the chips, of course. 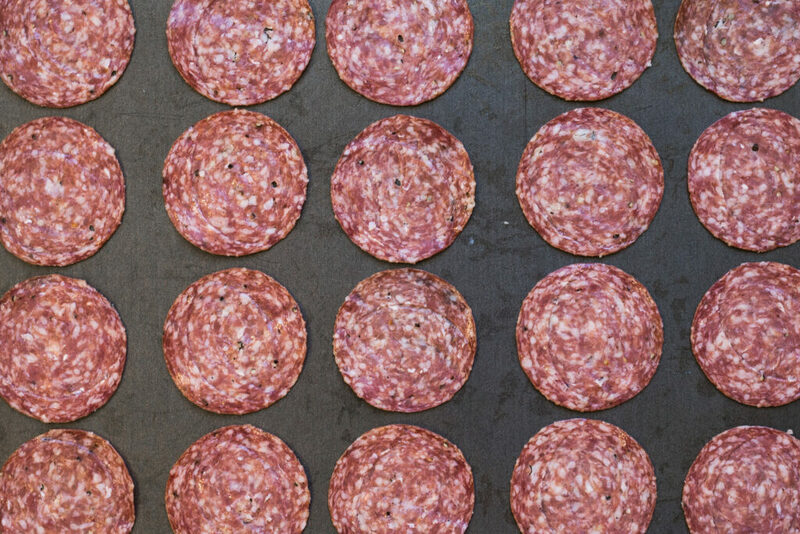 Lay out one package of salami on a cookie sheet, taking care not to overlap the slices. Place cookie sheet in the middle rack and bake for at least 15 minutes, until chips are crinkled, slightly browned, and have shrunk by about 25%. Cooking time will vary depending on your oven situation. If you notice the outside edges burning or start to smell any sort of burning, flip the chips and lower the heat by 25 degrees. Once chips are beginning to brown and fat is clearly rendered, remove from the oven and transfer chips to a paper towel to cool for at least 5 minutes. Note that the chips may not crisp up until they’re fully cooled, so force yourself to wait before diving in. 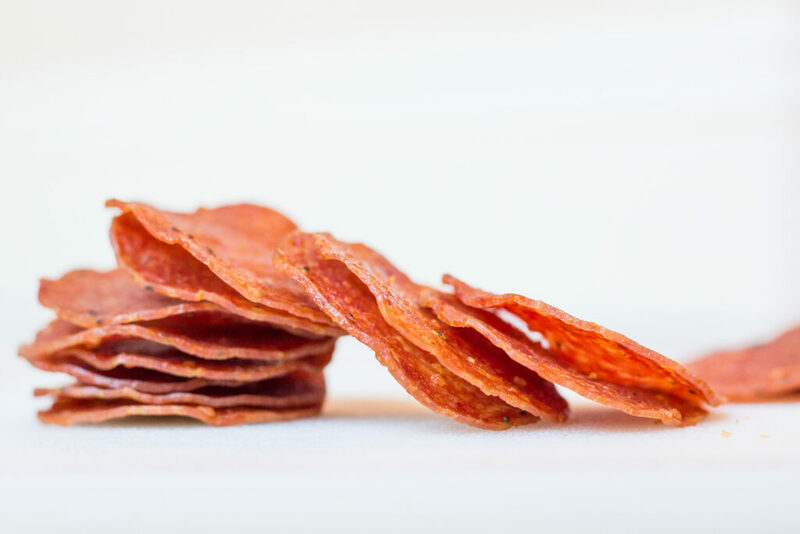 If you’re counting macros, the macro breakdown on these chips isn’t straightforward because it entirely depends on the kind of charcuterie you choose. You’ll have to use some common sense and you know, read the back of the label. Note that for salami and other sausages, the label will reflect the fat content from before the chips are baked. The fat will render out during cooking, so you’ll be left with less fat per serving than you would be if you ate the meat right out of the package. If you still want to calculate, you can measure out the rendered fat and subtract approximately 4g of fat per teaspoon of rendered grease from the overall macro count. Eat these crisps plain, sprinkle them on salads, or treat them like a chip and use them as a vehicle for dip. You’re welcome.